Where’s the love for October 7th? Going, it seems. It was the release date for Dragon Age: Inquisition, but that’s been pushed back to November. It was also when moody Lord of the Rings spin-off, Middle-earth: Shadow of Mordor, was set to launch. No longer. 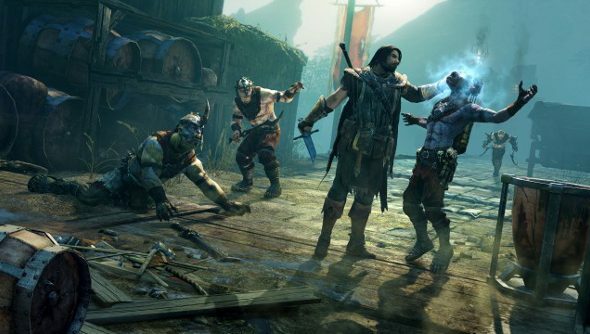 The good news, however, is that you won’t have to wait any longer to step into the boots of tormented ranger and orc murdering machine Talion. The game’s been pushed forward, releasing a week early on October 3rd, or September 30th for you lot across the Atlantic. October 7th is when Alien Isolation is due out, and until recently Dragon Age: Inquisition, so this might simply be Warner Bros. trying to avoid releasing Shadow of Mordor during a busier time. While it does look like it could turn out to be a hoot, there was some tough competition for our affections. The game is set between the events of The Hobbit and The Lord of the Rings, following the ranger Talion – and his wraith passenger – on a quest for vengeance after the death of his family. It’s a grimier, violent version of Tolkien’s world, with a focus on murdering and manipulating orcs rather than reciting elven poetry. Will the new release date make a purchase more likely?